Ordering lunch. Planning for Retirement. Marketing your business. Today, it’s all online. All of it. You’d be hard pressed to name an industry that hasn’t been turned upside-down by the dawn of the internet. Sure, change is good. But change brings challenges. With so much waxing and waning, how can businesses keep ahead of the curve and reach their customers? Is there an effective, reliable strategy for marketing your business online? Since 2009, FSC Interactive has made digital marketing our day-to-day routine. We left no stone unturned, and after countless hours of research, experience, and cups of coffee, we’ve found the answer to your business goals. For successful online marketing, your business needs the marketing funnel. Essentially, the marketing funnel is a road map of the consumer’s journey to purchase. It follows the natural flow of online shopping behavior and engages consumers in their online comfort zones – which is exactly where you want your conversion path to be. Interacting with your audience in their favorite corners of the internet is a strong move, but how you engage them is just as important. While whipping out your smartphone, connected to the internet, and making a purchase is possible to do in seconds, the consumer’s buying process is not so instantaneous. The marketing funnel lays out a blueprint for reaching your customer at each stage of their decision-making. 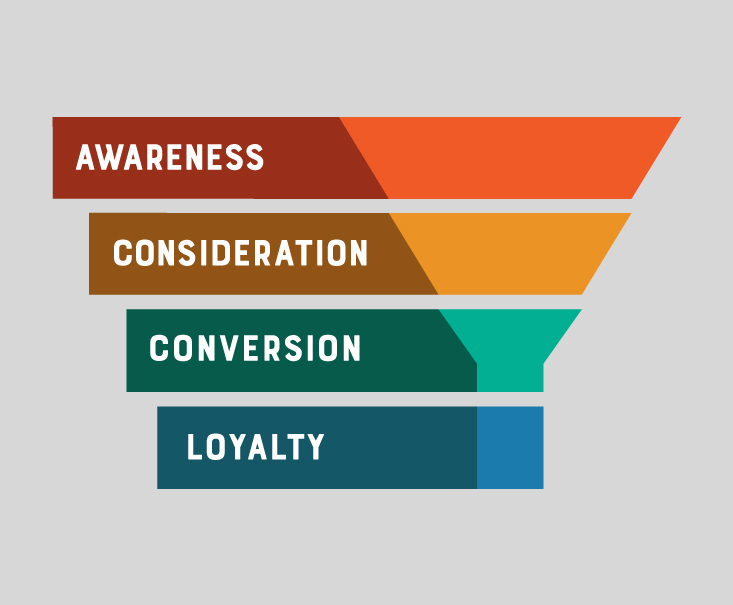 With a solid strategy for both where and how consumers receive your message, the funnel weaves your brand into each phase of their buying process: Brand Awareness, Consideration, Conversion, and Loyalty. But there’s another side of digital marketing that is just as essential for success. From concept to campaign launch, your marketing efforts need to draw from measured, proven figures to get the best results. Gathering data is one thing. But interpreting data is another beast entirely. There’s an endless amount of data available to digital marketers – consumer search habits, social media insights, online trends, so on and so on – and the sheer volume of valuable information can be a double-edged sword. It takes skilled, diligent analysis to gain an intimate understanding of your target audience, which is exactly what FSC specializes in. We’ve devoted endless hours to massing consumer data, studying the numbers, and refining them into fuel for effective, creative marketing campaigns. With data in the driver’s seat, your marketing funnel will work like a well-oiled machine. And like any winning strategy, it’s all about the details. Here’s how we fine-tune your marketing funnel for each phase of your digital marketing campaign. To thrive in today’s world, there’s no getting around the internet. We use it to keep up with friends, shop for groceries, find answers to tricky questions – “everything” just about covers it. It’s society’s most trusted tool. And to be a trusted brand, your business needs to be visible, convenient, and available online. This is the core concept of the brand awareness phase. It introduces your brand to the internet’s cultural conversation, adding your name into the everyday vocabulary of consumers. Being seen by your audience is the “big-picture” goal of any marketing campaign. But for digital marketing, that theory needs an update to work in practice. The internet is a big place, and unless you aim your efforts toward a receptive audience, your big picture ads can look more like a post-it note. Here’s where FSC’s thoughtful, thorough data analysis takes the field. We identify a targeted, large-scale audience for your marketing campaign, filling the top of your marketing funnel with willing and interested consumers. Odds are that you don’t make very many purchases on a whim, and neither do most online consumers. For today’s buyer, researching is an inherent part of the online buying process. Customers typically browse before committing to a purchase, looking for brands they are familiar with, and then compare and contrast their options. In this Consideration phase of the funnel, your audience is set on buying but is still debating brands. To reach these consumers, brand differentiation is key. Tell them why your business stands above the rest. No broad terms, no vague generalities. When your audience engages with your brand (i.e. through an ad, a visit to your site, a newsletter sign up) you need to put their deliberation to bed and guide them along to the next phase of the funnel. That’s why FSC Interactive’s creative team specializes in putting your brand’s best features forward, pinpointing your audience’s needs with creative and persuasive ads. The conversion phase is the most crucial step in the market funnel. The consumer is fully nurtured, ready to take action. They know your business. You’ve made it on their consideration list. And it’s your job to tell the consumer to choose your brand and to act now. At FSC, we make sure your message is clear. We call your customers to action, inviting them to buy now, book now, call or email for more information, or fill out a form to get started today. The conversion phase is where sales are made. And a strong, confident voice can seal the deal. Congratulations! A consumer made it through the funnel and is now a customer. Conversion calls for celebration – but then what? The journey doesn’t stop there. Now that you have a new customer, you need to dazzle them. Give them the best experience possible. Make your customers feel like more than just a sale. They need to feel like a valuable part of your brand. Why? Because customer satisfaction is your most valuable marketing tool. When you go out of your way to please your customers, you give them a reason to give back. They are much more likely to pay it forward when you ask them to refer a friend or continue to spend their dollars with you. Treat every customer right and you will earn their loyalty, which opens up a whole new world of marketing possibilities. Studies show that previous customers engage 60-70% more with brands than any new, potential leads, which account for 5-20% engagement on average. Don’t undervalue your loyal clientele. They are a valuable, cultivated audience. Through remarketing efforts like special offer campaigns and email marketing, FSC nurtures happy customers and long-lasting relationships. We grow an authentic, loyal following for your brand and make sure your customers keep your business in mind. The marketing funnel is the essential recipe for effective digital marketing. It guides all the puzzle pieces into place with an intuitive blueprint of online success. With a thorough analysis of your valuable data, the funnel can put your marketing efforts right to work. Interested in how we would build out a funnel for your brand? Contact FSC today. We’d love to talk.